Following from this year's Qingdao Summit, the Shanghai Cooperation Organization will continue to foster new prospects for the integrated development of its member countries, bringing fresh impetus to global growth. Speaking in an interview at the Young Icebreaker annual gathering in London, U.K. businessman Gerry Grimstone spoke positively of China-U.K. investment relations and of the future of market reform. 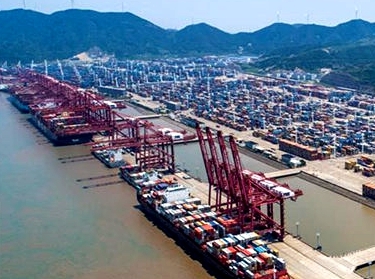 Ningbo, one of the first cities in China that opened up to the outside world, has greatly enhanced its economic and trade ties with foreign countries over the years. Chinese State Councilor and Foreign Minister Wang Yi on Thursday started his visit to Germany, a trip which will also take him to Brussels for the China-EU high-level strategic dialogue. China's latest opening-up measures of easier trade policies and increased import orders will benefit its high-quality development and boost world economic growth. Let's take a look at the 10 most reputable companies in China. Five years after its inception, the growing new city of Jiashan continues to attract new industry and serves as a thriving model for sustainable urban development. As China's manufacturing sector increases the scope and pace of its opening-up, domestic industries are expected to upgrade themselves while foreign companies, too, eye many benefits, industry experts said. Yang Chenglan's online shop, selling handmade cloth of the Dong ethnic group, earned more than US$313,676 in 2017, helping more than 80 families live a better life.